Krispy Kreme is celebrating National Doughnut Day the best way – your way. On Friday, June 2, select one free doughnut from the entire menu – any doughnut, all day long, at participating shops in the United States and Canada. Krispy Kreme Doughnuts believes that National Doughnut Day is best experienced when guests can enjoy a delicious treat made fresh daily, just for them. That’s why we are encouraging everyone to participate by choosing their own favorite. Customers can select from dozens of Krispy Kreme varieties like the classic, mouthwatering Original Glazed® doughnut or specialty flavors like the Chocolate Iced Kreme™ Filled Doughnut or Strawberry Iced Doughnut, depending on shop availability. With dozens of Krispy Kreme flavors to choose from, how will guests pick their favorite one to enjoy for free? Visit Krispy Kreme’s Facebook and Twitter pages for interactive assistance. Then, show your friends how#youdoyou on #NationalDoughnutDay by posting a photo with your favorite doughnut & tagging Krispy Kreme on June 2. 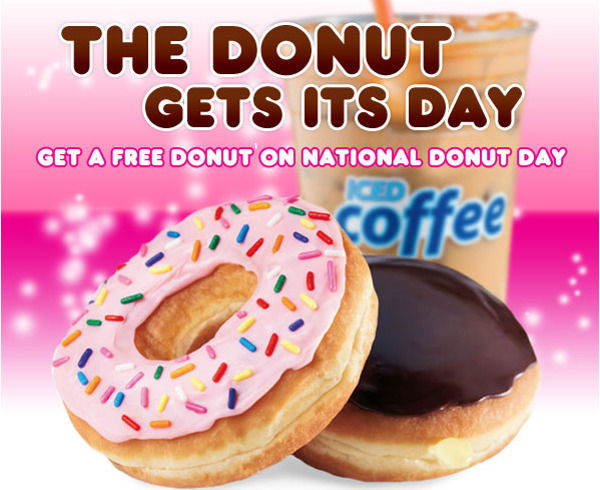 On Friday, June 2, 2017, you can get a free classic donut with any Dunkin’ beverage purchase at participating Dunkin’ Donuts locations & celebrate National Donut Day.